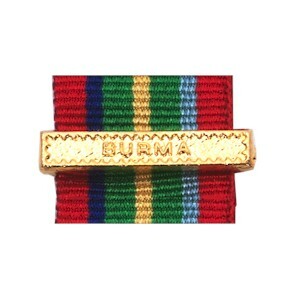 Description: A clasp with beaded border with the raised inscription BURMA in the centre. Comments: Qualifying service in the Burma campaign counted from 11 December 1941 and included service in the Bengal or Assam from 1 May 1942 to 31 December 1943, and from 1 January 1944 onwards in these parts of Bengal or Assam east of the Brahmaputra. Naval service in the eastern bay of Bengal, off the coast of Sumatra, Sunda and Malacca also counted.